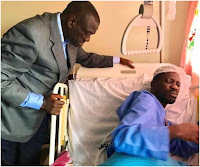 Thursday, August 30, 2018 - Veteran Uganda opposition leader, Kizza Besigye, visited Bobi Wine in hospital on Wednesday where he’s recovering after he was arrested and tortured by the Ugandan army. During the visit, Bobi wine showed Besigye, who has also been incarcerated in the past for opposing Museveni, some of the injuries he sustained in the hands of the army. The musician-turned firebrand politician is set to be flown to London for specialized treatment. “We shall overcome!” said Kizza on Twitter.